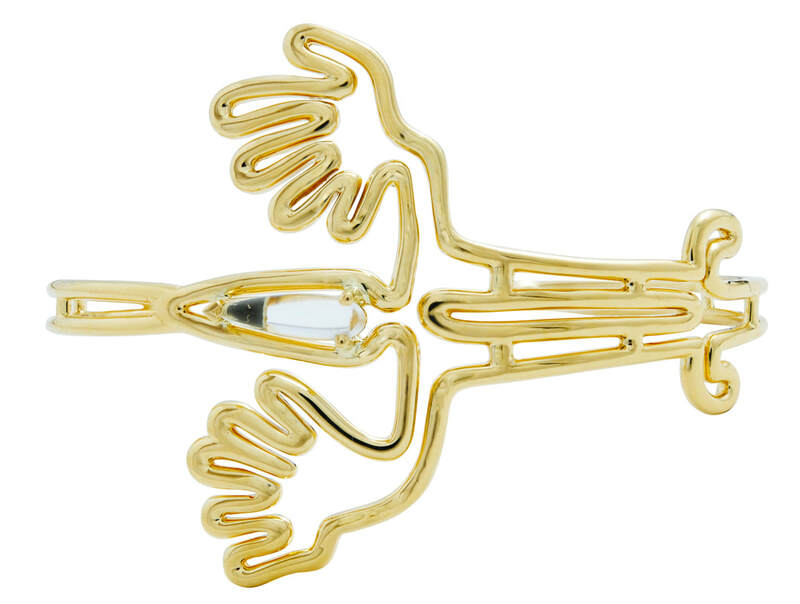 This earring evokes the Monkey carved in the Nazca Desert, made in 18K gold accented with diamonds. One of the world’s most intriguing and mysterious archeological finds is the collection of giant geoglyphs—ground drawings—located in the Peruvian coastal plain about 250 miles south of Lima. These remarkable motifs have captured the imagination of French designer, Lydia Courteille, who recently introduced her Nazca Collection, which evokes some of these enigmatic geoglyphs. 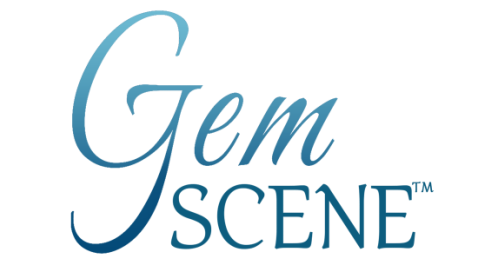 Available in 18K gold with diamonds and colored gems, the collection depicts many of the Nazca motifs, including birds, whales, spiders, dogs, spirals, hands, monkeys, lizards and more. Ring depicting a Spider in 18K gold accented with diamonds. 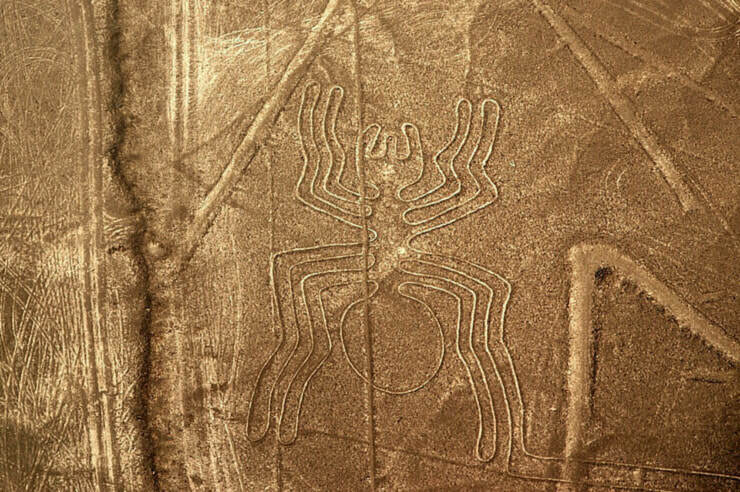 The Spider carved into the Nazca desert about 2000 years ago measures 47 meters in length. 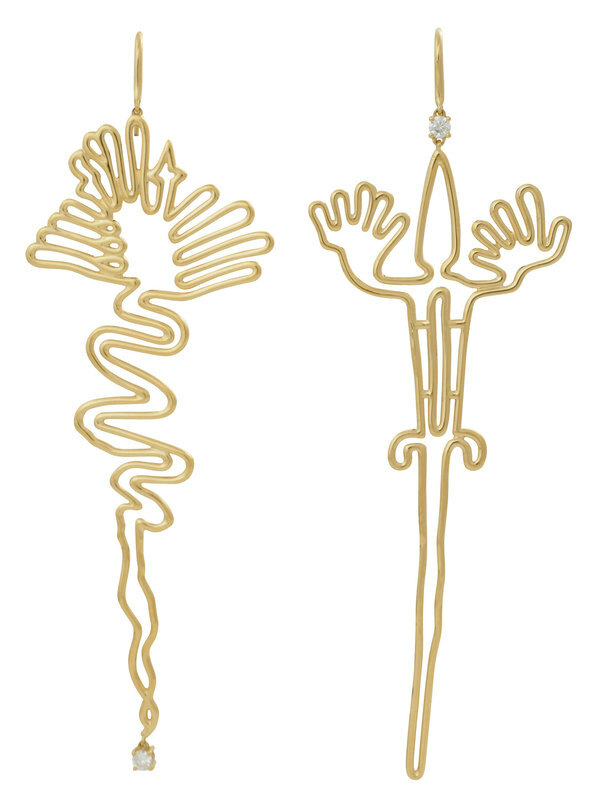 Left earring depicts a Flamingo and the right earring represents a Lizard, which are among the geoglyphs in Nazca. 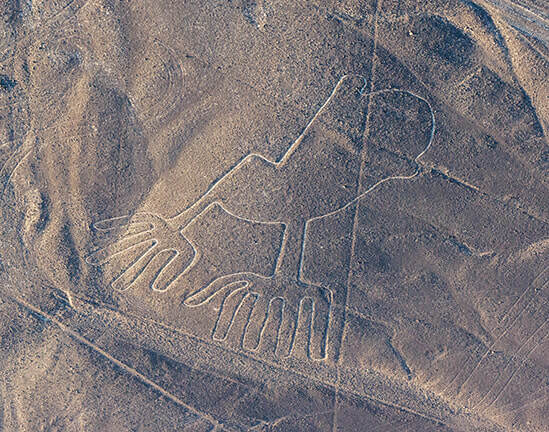 The geoglyph of a Flamingo or Heron in the Nazca Desert. 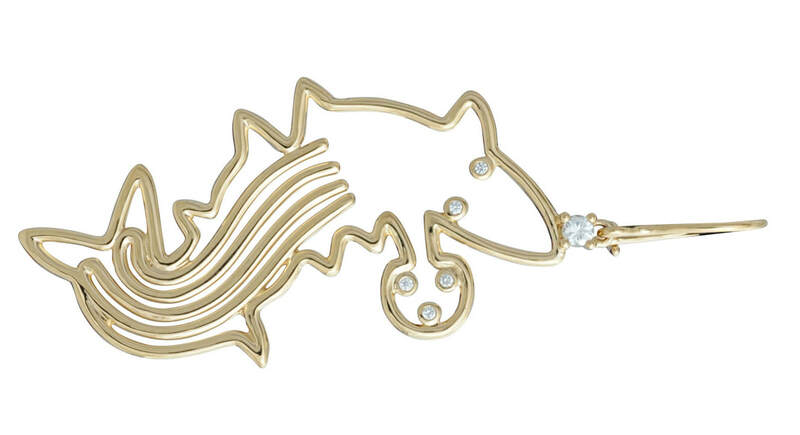 The Whale is available as earrings or rings, in 18K gold and diamonds. 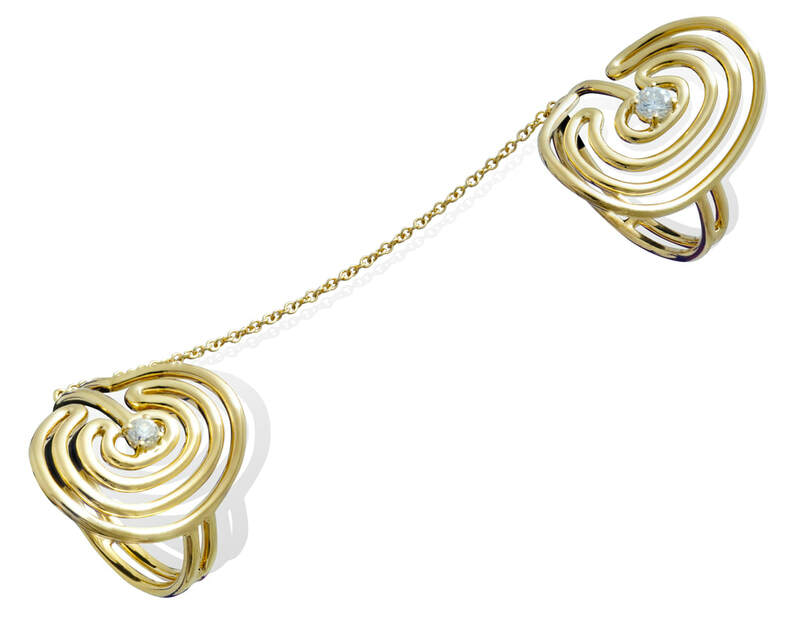 Double rings in 18K gold and diamonds evoking the Spirals in the Nazca Desert. 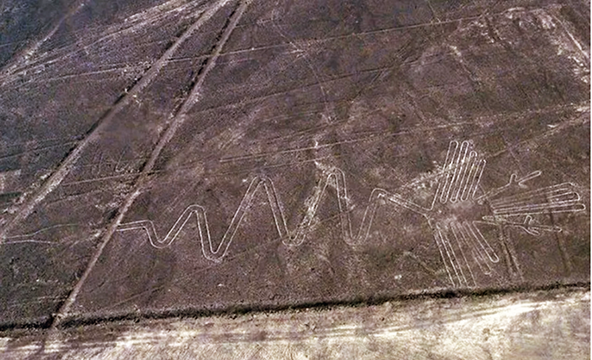 One of the many Spiral designs that make up the hundreds of geoglyphs in Peru. 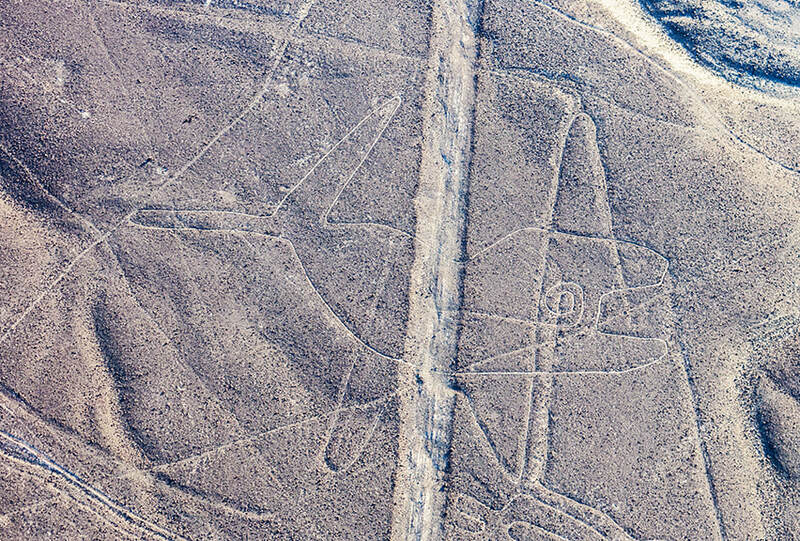 With more than 1200 motifs etched into the ground—best visible from the air or the nearby hills—and measuring sometimes hundreds of meters or more, these geoglyphs are thought to have been created by the ancient Nazca culture some 2000 years ago. 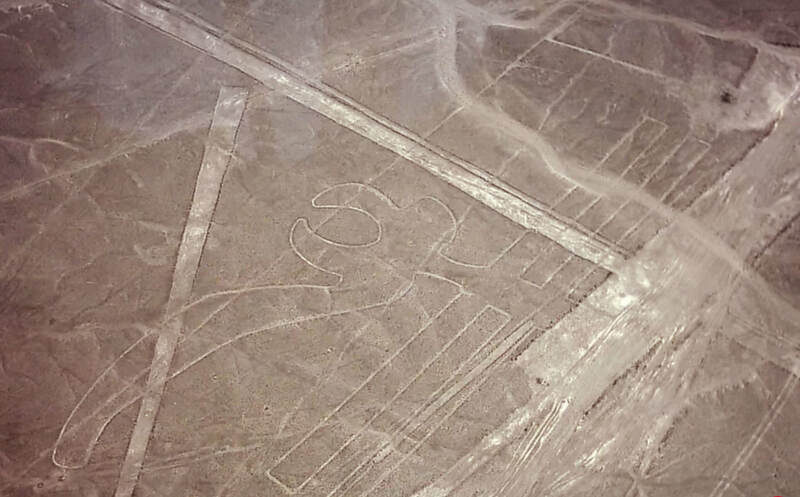 There are three basic types of these Nazca Lines—straight lines, geometric designs and pictorial representations of animals and humans. Along the coastal plain, there are more than 800 straight lines, some more than 50 kilometers in length. Also found are more than 300 geometric designs that include trapezoids, triangles, rectangles, spirals, arrows, wavy and zig-zag lines. More than 70 complex depictions have been found of animals and plants, some measuring more than 400 meters. They include a monkey, whale, llama, duck, flower, tree, lizard, hummingbird, dog, flamingo (or heron), cactus, fish, spider and more. Just recently, archaeologists in Peru announced they have discovered more than 50 new examples of mysterious giant geoglyphs that have been etched into the Earth’s surface. To create these remarkable motifs, the Nazcas removed 25 to 45 inches of the reddish iron-oxide coated pebbles that cover the Nazca Desert floor, exposing the lighter colored clay below. High in lime, this lighter layer hardened with the morning mist to form a protective layer that shields the lines from winds, thus preventing erosion. The sharp contrast between the lighter colored trenches and the reddish surrounding landscape creates the distinct designs of the Nazca Lines. 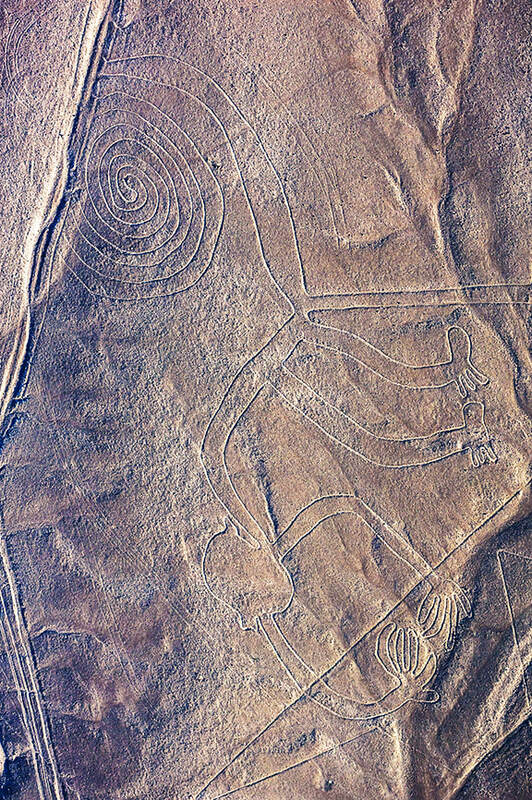 Most of the geoglyphs were created by removing rocks from the borders of the figures to create an outline. Others were formed by removing the top layer of rocks from the interior of the design, as seen in the some of the geometric designs such as the trapezoids. The Nazca Desert is one of the driest on the planet with an average temperature of around 25°C all year round. The lack of wind helps keep the lines uncovered and visible. The reason that these ancient people created the geoglyphs has been an open question since their discovery. 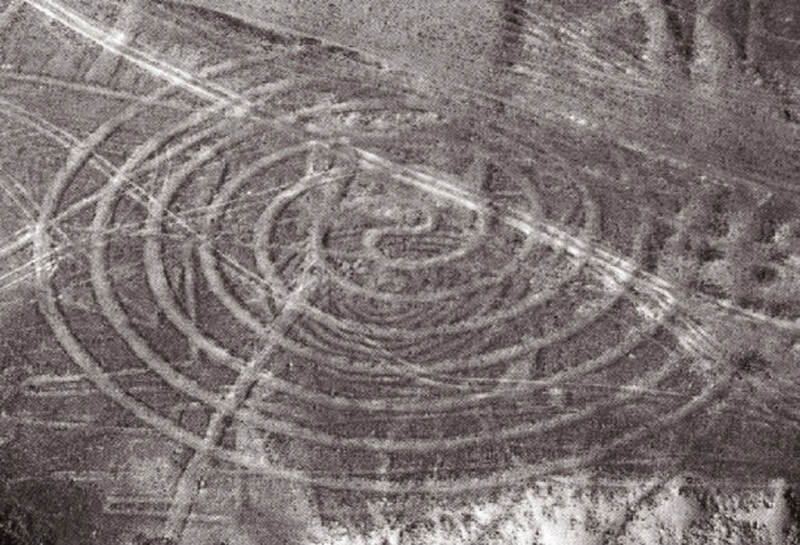 While many explanations have been put forth over the last 80 years, ranging from astronomical calendars to alien landings to religious rites, these remarkable geoglyphs continue to guard their mysterious secrets to this day. In recognition of its unique historical value, the area was designated a UNESCO World Heritage Site in 1994. Shown​ here are a few of the pieces in the Nazca collection by Lydia Courteille along with the geoglyphs that inspired them. Photos are courtesy of Lydia Courteille unless otherwise indicated. Earring depicting a Dog, in 18K gold accented with diamonds. 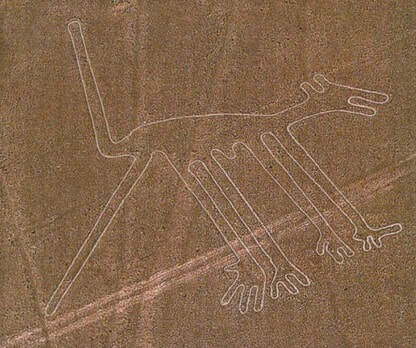 The Dog is one of more than 70 depictions of animals found in Nazca. 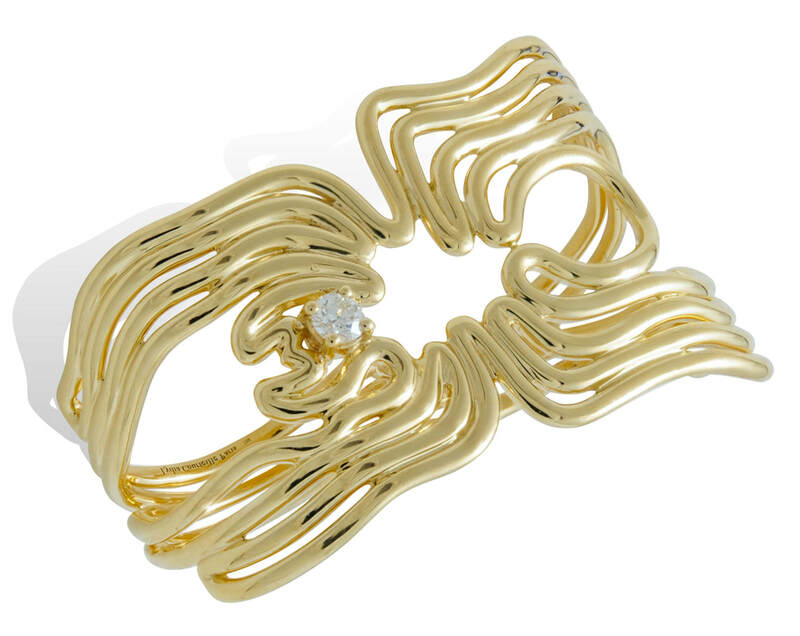 Bracelet in 18K gold accented with a topaz evoking the Hands geoglyph. 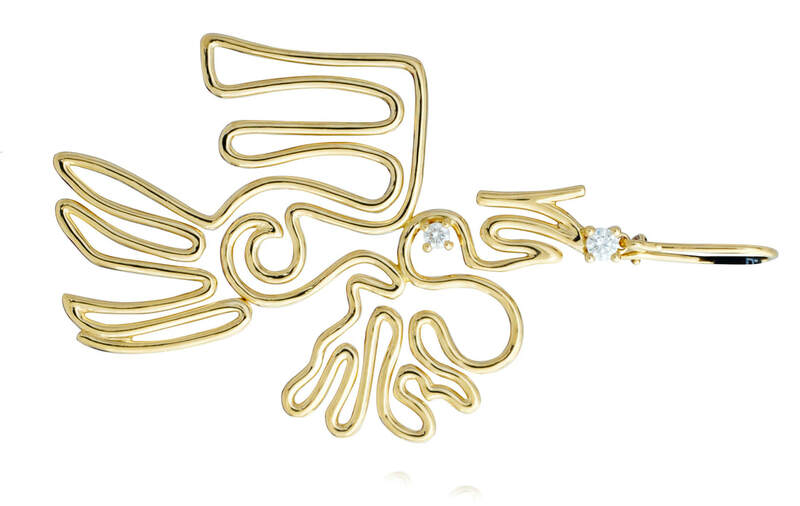 This earring in 18K gold with diamonds is a stylized version of the Nazca Pelican. Parrot ring in 18K gold accented with a diamond and topaz. 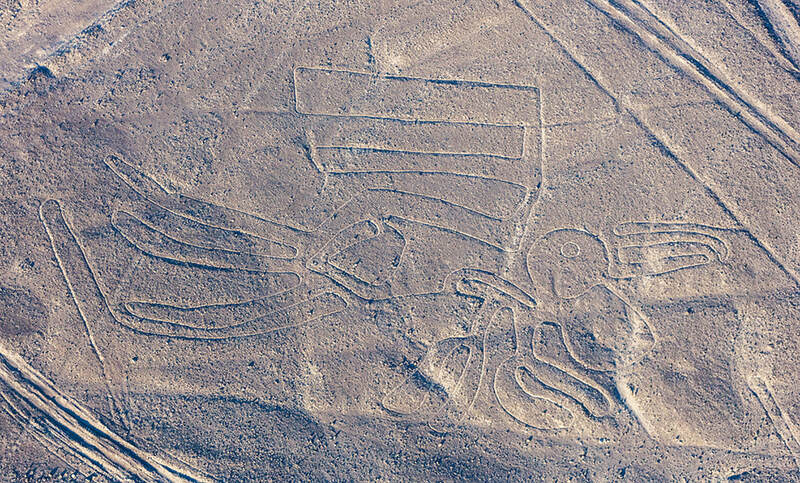 Partial view of the Parrot in Nazca.